The commercial doesn’t reveal much detail on the Dell Streak 7 in terms of specs or any potential launch date or price but it does present it as an all-in-one device – from gaming, to working with spreadsheets, multimedia, navigation, social networking and an eBook reading. The Dell Streak 7 will run Android with a Stage UI skin (just like the 5” Streak) and its screen will be protected by Gorilla Glass. The ad doesn’t mention voice-calling but it’s a likely feature – the smaller Streak has it and having a SIM card inside the device is a requirement for access to the Android Market (which the Streak 7 does have according to the commercial). Not that voicecalls are the most important feature for a tablet. 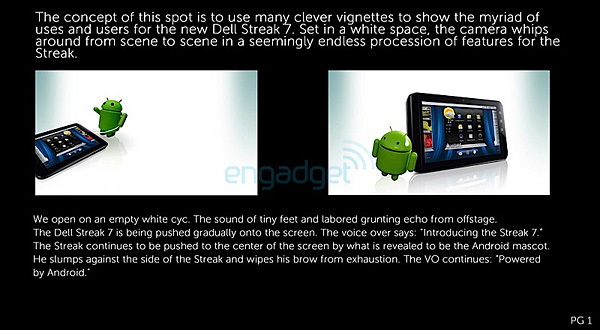 It’s possible that the Dell Streak will make an appearance during CES, which is about to set off in early January, and then we’ll have all the details we want – maybe even see the pages of this script in a finished, animated form.